Every year, John Lothian News puts together an industry leader series filmed at FIA’s annual conference in Boca Raton. The number of interviews filmed this year is a JLN record and the footprint of the market participants involved is similarly far-reaching. 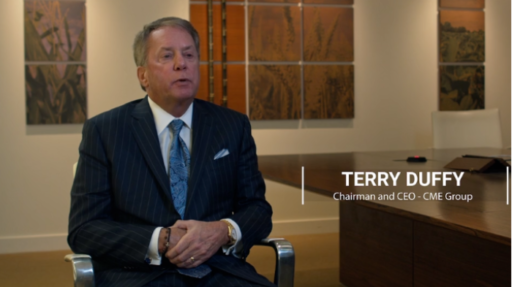 In the lead up to the conference, JLN sat down with CME Group Chairman and CEO Terry Duffy to discuss what 2019 holds for the world’s largest derivatives exchange, covering such topics as political uncertainty, the NEX integration, and following up on a record 2018. The revamp of regulations over the past 10 years has made FCM brokerage more difficult in many ways and certainly more expensive from an audit and compliance perspective. The good news is that the industry has also become far more technology driven. Yes, this is old news, but the growth of FCMs is firmly embedded in technology – for connectivity, trading tools, access to more markets and even in the algorithms used by traders today. Despite murmurs about Thesys’s ability to deliver on the Consolidated Audit Trail and several missteps along the way, the news that it would be replaced as the plan processor still came as a surprise to most industry participants. Though further changes to the current rollout plan under FINRA are not expected, the transition will be complex. RegEdge CEO Harshad Pitkar looks at what happens next, why there likely will be another delay, and what the industry should do now. ****SD: If it’s not delayed now I’d be surprised. The calm in Treasury markets has snapped. A measure of U.S. rates volatility just staged its biggest two-day surge since 2016 as the vanishing spread between short- and long-term borrowing costs — typically seen as a harbinger of a recession — intrudes upon the calmest rates market in a generation. There are many silly things written about commodity traders, and alas many of the purveyors of this silliness get paid large amounts of money for it. Case in point, this just-released Oliver Wyman study, “Commodity Trading Goes Back to the Future.” The piece begins with a well-recognized fact (that I’ve written about frequently in the past): commodity trading firm margins are down, relative to 2014-15, and especially 2008-9. INTL FCStone, which owns one of the largest independent futures brokers in the U.S., has set its sights on Asia. On March 19, the firm announced a deal with Singapore’s United Overseas Bank to buy its futures trading and clearing business. Once the deal closes, INTL FCStone plans to establish a full-service brokerage in Singapore and use it as the foundation for expanding its presence in the region. ****SD: A lot more detail on the recent deal. Demand for protection against a steep slide in sterling has reached its most extreme level since the aftermath of the Brexit vote nearly three years ago, as concerns grow among the financial and business community over the outcome of the UK’s efforts to leave the European Union. Hedge funds bought another 65 million barrels of petroleum futures and options in the week to March 19, taking total purchases over the last 10 weeks to 384 million barrels, according to reports published on Friday. Lawyers for the US Commodity Futures Trading Commission have agreed to settle a high-profile futures manipulation case against the food companies Mondelez International and Kraft Heinz, less than four months after the regulator suffered a bruising loss in another case. ****SD: A case with big implications for the derivatives world. Staff at the Financial Conduct Authority took 25,887 sick days last year, the UK regulator’s worst set of figures for six years and more than 60% higher than the national average, raising concerns about morale. The regulator lost more than 100 years of working days to sickness absence in 2018, figures obtained by Financial News via a freedom of information request show. The watchdog’s employees took almost 500 sick days per week last year, almost twice as high as the London average. ****SD: After being so used to seeing phrases like “Over 100 years combined industry experience” in corporate literature, it’s funny to think of over 100 years of lost industry experience. Gas and power traders layering or spoofing the order books of exchanges with non-genuine orders risk fines for breaching EU REMIT rules, even if they do not impact the market, according to EU energy regulatory agency ACER. ****SD: Speaking of spoofing – Citigroup Faces $1.2 Million Fine for Allegedly Manipulating Japanese Government Bond Futures. Eurex Clearing, one of the world’s leading central counterparties (CCP) and part of Deutsche Bˆrse Group, extends the transparency of its real-time risk management Prisma based on cloud technology. As of 25 March, clients can simulate margin requirements for both exchange-traded derivatives (ETD) and over-the-counter (OTC) contracts, including cross-margining using Eurex’s Prisma Margin Estimator in Cloud (Cloud PME). Strong personal relationships have always been a cornerstone of the securities lending marketplace. Market participants focus on developing a broad, reliable network of relationships, so they can be the first lender borrowers contact in the morning, or the first borrower to be offered hard-to-borrow securities by a lender. While strong relationships will always be important, there is a growing emphasis on data collection. Decisions are being influenced by data analytics. In my view, the future of securities lending will be data-driven and the leaders will be those that make the most effective use of data. The U.S. Federal Reserve intends to shorten the duration of bonds it has on its balance sheet to build some firepower in case it needs to use it as a stimulus tool once again, Federal Reserve Bank of Philadelphia President Patrick Harker said on Tuesday.